You’ve probably already heard about “Wodehousing,” a disturbing trend in which teenagers videotape themselves covering strangers’ homes with the full text of P.G. Wodehouse novels. . . Though the British author was an eminent jokester and wit, his pranks never included writing the entirety of his novels sentence-by-sentence on unsuspecting neighbors’ homes. The first documented instance of “Wodehousing” occurred in New Jersey in 2011. Scrawling the entirety of Wodehouse’s 1938 book The Code Of The Woosters on someone’s house might seem like fun to the teens doing it, but to homeowners it’s anything but. It can take hours and cost hundreds of dollars to scrub away passages describing (often in spray paint!) the buffoonery of Bertie Wooster and his quick-thinking butler, Jeeves. 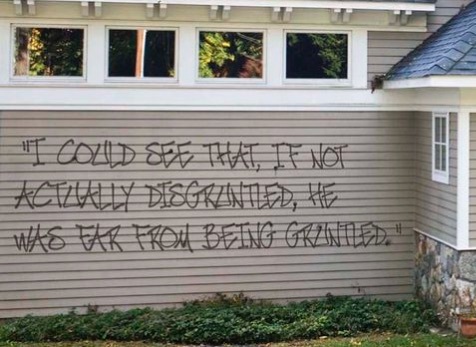 Defacing someone’s walls with one of Wodehouse’s short stories (or short story collections) is considered a lesser form of “Wodehousing.” Works by Wodehouse contemporaries such as James Thurber and Raymond Chandler are similarly looked down on.